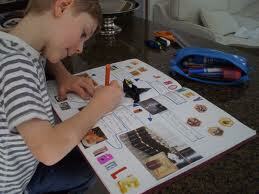 Helping your child to be successful with their homework is about planning. Plan a time when your child can concentrate and an adult is available to lend support to the task. Some children will be able to do homework right after they finish school other children will need time to do some physical activity before they can concentrate and yet other children will need to eat first. You will need a spot that has limited distractions, minimize stimulation from video screens and phones and reduce loud conversations with other family members in the homework area. Large projects take more than one night to complete. Help your child learn how to plan ahead. Look at the week and weekend and see what time is available to work on the project. Divide the project into smaller sections that can be completed a little at a time during the week and on the weekend. At first it takes a lot of discipline from the parent and the child but as the family gets used to planning ahead your child will tell you that they need your help with some homework and the only night you are both home is Wednesday. It will be great when they take over the time management of homework. Teach your child management so they will have enough time to complete large projects. Each child will be different, some will like quiet spaces and others will like to be around people. Some tasks will need large spaces and others will need hardly any space. Click To Tweet Many families have shared custody of children between parents and some families are always on the move taking children to after school events where children need to do homework while they are waiting for siblings to finish an activity. Taking into consideration all the variables, homework areas need to be portable. 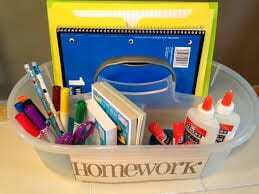 Children need have a container with all the pens pencils markers erasers ruler stapler tape glue paper calculator etc. they need. This container can be used in any room in the house allowing for flexibility. Let your child organize the container since they know what they need. This container can be put in the car and taken along to activities, babysitters, parent’s homes. It is important that children have the supplies they need and learn to take care of them so they can get their work done. If you choose to have one room or area for homework make sure to consult your child about what it should look like so they want to work in that area. Share your tip for making homework and enjoyable experience. It is hard for children to get back into a routine after a summer of fun. This is great Julie! 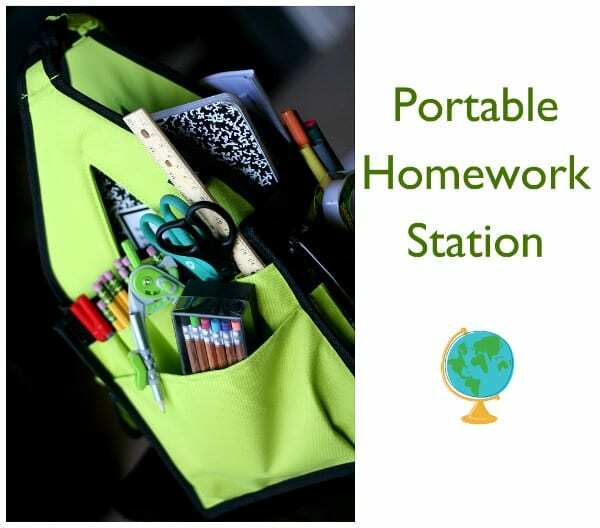 Love the idea of a portable homework station. My son will be starting grade 1 so this whole homework thing is a bit new to me! It is nice to have a portable homework station organized so you can quickly take it with you when unexpected events happen. You and Andi are of like minds this week! I guess it is that time. Love the homework caddies… they are so important as most kids like working at the kitchen table, and you need a quick and easy way to clear those supplies up when it is time to eat! Where I live we are only half way through the school summer break. It was good to be reminded by Andi that some places are getting ready to go back to school. It is amazing how fast the summer goes and how early the organizing for the fall begins. Julie, I love that you reminded parents “At first it takes a lot of discipline from the parent and the child . . . .” We just need to be reminded that it takes “a lot of discipline,” but the upside is that is “at first. ” Time well spent at first yields huge rewards for both the parent and the child. Yes you’re right the rewards are worth the effort. Although it is sometimes hard to remember that at the end of a long workday, if you are a single parent and when life throws you a curve ball. Thanks for your comment. I’ve never heard of a portable homework station, but what a brilliant idea! Wish I’d thought of it when the kids were young. Great tips! Planning ahead can be a bit easier by writing down the steps to be accomplished on colorful sticky notes. It is fun to watch the notes disappear as you get closer to finishing the project! Each note is one small step, but it leads to success!! I like this idea. It is really great for helping children realize how many steps there are in completing a task and helping to avoid discussions over how much time it will take. The number of post it notes will help to demonstrate if it is a quick task or something that needs more time. This would work for more than just homework. Thanks for the tip.